I went fully vegan and mostly gluten-free in January right before my return to seminary. The first inklings that I would eventually be vegan came early on. For as long as I can remember, driving past the cow pastures and seeing trucks full of chickens, cows, and pigs really bothered me. I knew where they were probably headed and it bothered me that I’d just seen a particular type of animal and suddenly that animal’s flesh appeared on my plate. I remember one particular instance when it felt acutely painful. We were on a family vacation to New England and were eating lobster at every stop. Most of the restaurants let you choose your lobster. So I would look at these sad little lobsters who were basically like cows headed to slaughter and think, “Nope, I can’t do it.” But as long as I didn’t choose the lobster, I was able to eat them. Guiltily. Choosing, again, to close my eyes to the torture of the animal so that I could enjoy a tasty meal. And then, sometime in August of 2013, it changed. That’s the thing about life: experience shapes you. If you’re lucky, it may even radically change you. I went pescatarian (no meat except seafood) on August 14, 2013–a decision made primarily for my health. Meat was terribly difficult to digest. As a person with lupus, I have flare-ups of gastroparesis (basically a kind of stomach paralysis). Fibrous foods and those high in fat can pose a real challenge. Even armed with this info, I didn’t go vegan. I worried about how narrow my diet would get if I had a flare up and couldn’t eat many veggies. And, if I’m being really honest, you guys, I just really loved seafood. I flirted with veganism for short spurts during that time. I’d “cleanse” my body of animal products and gluten periodically (simply by abstaining from them). I felt good during those weeks. At some point last year, I began considering what being vegan would mean for me. One thing you should know about me is that I am terribly indecisive. I always have been. It’s what has kept me sitting on this post, editing it for days now. I’d like to put a positive spin on it and say that it’s because I’m just that thoughtful. Perhaps, so, but I’m probably thoughtful because I’m anxious about… everything. Should I be vegan? I feel better that way. I abhor the torture animals go through in factory farming practices. I live in America in the twenty-first century and I have the resources to abstain. Logic says, yes. Should I still consume wheat and gluten? I’m not allergic, but I feel better when I don’t. I don’t need it to live. Logic says, no (but don’t be a maniac about it). Finally, I “bit the bullet” (strange metaphor for an herbivore, I guess) and stopped knowingly consuming animal products. I find out new and perplexing information about products I use every day. One that got me, for instance, is that most wine is NOT vegan. That’s right. That magical elixir made from a most precious fruit is NOT always vegan. Luckily, even though I love wine, I’m not much of a drinker (more than a glass of wine and I’m practically on the floor), so this doesn’t pose a huge challenge. Plus, there’s always Barnivore! I’m also researching other products I use (lotions, toothpaste, etc) and replacing them with cruelty-free products. I won’t be buying any more leather items, obviously. 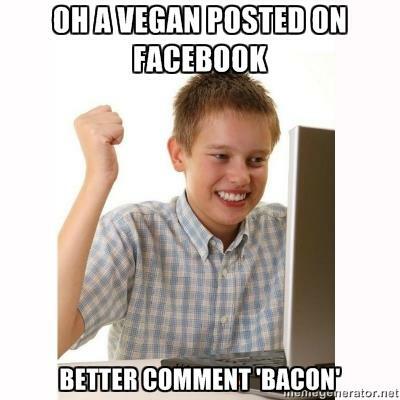 Before someone comments (as some of the more obnoxious meat eaters tend to do on vegan posts), “But BACON!” <insert all the eye rolls> I’d just like to say that bacon is not what would bring this vegan back to meat; I’ve never been especially fond of it. And knowing the truth of how it becomes bacon has put me off it permanently. I have found that being an herbivore is best for my health and fits my worldview, but I cannot tell you what’s best for you. I’m not saying that everyone should be vegan or that you aren’t a good person if you consume meat. I’m the only one in my household who abstains (but the rest are not big on it, to be honest). When I do get animal products for them, I shop as responsibly as I can afford to, avoiding those from factory farmed animals. No matter what you choose to eat, be as conscientious and mindful as you can about where it comes from (this goes for more than just your meat). Do this for your health, for the health of our planet, and for the well-being of its other inhabitants.